The Doctors at Elevate Chiropractic have Certified Advanced Proficiency in Torque Release Technique, which has been proven through research to be one of the most specific, scientific chiropractic techniques in the world. Torque Release Technique is the first Chiropractic technique of the new millennium and provides members of all ages with some of the most gentle and reproducible chiropractic adjustments available. 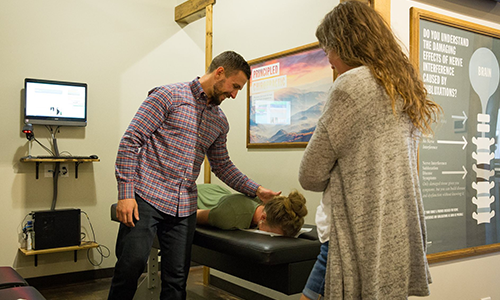 Our Fort Collins chiropractors utilize this technique to find the root cause of health issues and because of that, get to see life changing results on a daily basis. Torque Release Technique has been designed as part of scientific research into the health benefits of chiropractic. It is in fact a collaboration of the top seven systems of chiropractic assessment and care. Peer reviewed studies in well-respected psychiatry journals showed astounding results in reducing anxiety and depression levels, as well as improved measurements of well-being when Torque Release Technique Chiropractic Adjustments were received. Torque Release Technique was not created for a specific condition but rather out of random controlled trials for the purpose of elevating the subjects state of well-being and true health potential.